37 clinical studies, 7 patents. We’ve discovered the Fountain of Youth. Living in pain, stiff muscles, achy joints, and hurt all the time? Wrinkles getting deeper? Hair getting thinner? Not any more! “Therapeutic” Aromatherapy. Non-toxic, pure therapeutic Essential Oils work naturally for better sleep, better demeanor, clearer focus, control over eating, our pets AND our parents. 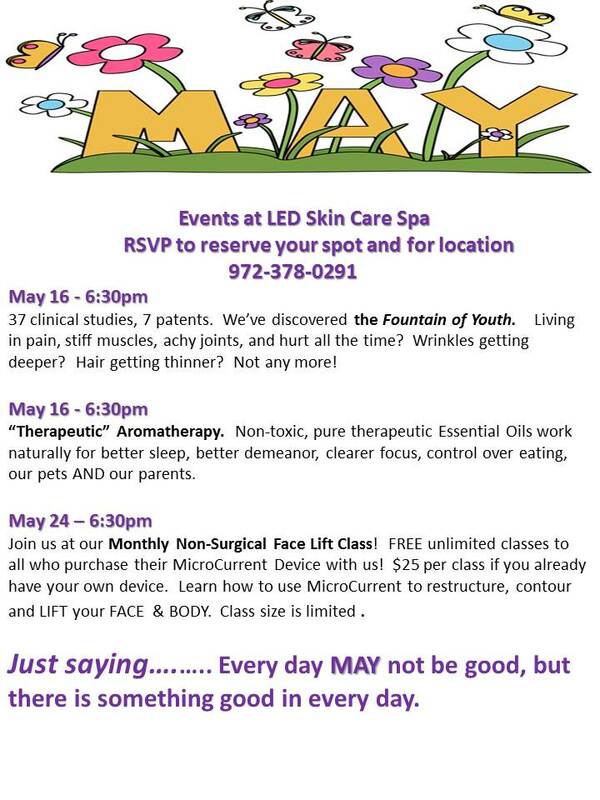 Join us at our Monthly Non-Surgical Face Lift Class! FREE unlimited classes to all who purchase their MicroCurrent Device with us! $25 per class if you already have your own device. Learn how to use MicroCurrent to restructure, contour and LIFT your FACE & BODY. Class size is limited . Just saying….….. Every day MAY not be good, but there is something good in every day.